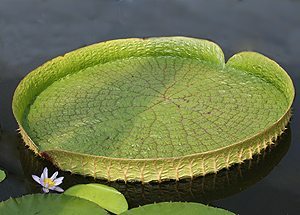 It is rare in cultivation, however Victoria amazonica which is commonly known as the ‘Giant Water Lily’ or ‘Amazon Lily’ has been grown in Australia since the mid 1800s. It is rare because of the conditions it need to thrive, and these are strictly tropical. Although plant hunters have been growing them in conservatories for nearly 200 years. What is the Giant Water Lily ? Victoria amazonica is the largest water lily in the world, the pad of this giant plant can reach up to 3m across and this magnificent specimen from the shallow freshwater lakes of the amazonian basin is grown around the world, for its flowers but mainly for the giant lily pads. In the Victorian era, and this plant is named after Queen Victoria, many a photo was taken of children standing on these gigantic floating plants. Nearly all of the images we see are of of green pads, however once pollinated they actually turn purple and begin to smell a little. The upturned rims (see picture below) and the flowers which are around 30cm across add to the fascination. So here we have it Victoria amazonica the worlds largest water lily, our photograph is of a baby one, only 1m across. These amazing plants will flowers however flowers open at around dusk. At this time they attract beetles that are a means of pollination. The flowers that open white will turn purple after pollination. This is a tropical plant and as such requires warmth year round to survive. It is grown indoors in both Melbourne and Adelaide in the respective botanical gardens. We guess you could grow it in a greenhouse in a large pond if you have the inclination. Or you could treat it as an annual and try growing it outdoors, you would need to maintain a minimum temperature of around 19°C.